The cool summer of 1998 slowed down the maturation of the grapes. The growing season is usually helped by California's Indian Summer, a warm period in September and October. The cool climate continued, however, with many vineyards carrying too large a crop. As a result, the wines of the 1998 vintage are quite variable. Some sharp growers reduced crop levels in an effort to gain maturity in the grapes. Others were lost souls. Many critics have proclaimed the vintage as a poor one. It is not "poor," it is variable. Some wines are quite good and you'd have a tough time determining the "low quality" of the vintage. It is the jokers who got nailed in this sort of growing season. What is a challenge is the price levels being asked for the wines. 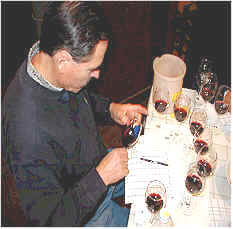 Many Cabernets are viewed by their producers as a supreme art form, not as a meal-time beverage. The king's ransom you'll need to pay for some wines can be argued as unjustified based on the quality. We found some good wines in this tasting. One was regarded by many tasters as deficient in quality. 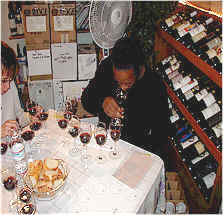 The rest were wines most tasters felt could justify a price tag of $20-$40. Well behind the "pack" in this tasting, this small winery's wine was hailed as "Foul!" by one taster. Another described it as having "...Brettanomyces, but nothing else there to keep the 'Brett' company." Someone else described it with terminology we've never seen on the back label of a wine bottle, "It's like burnt ozone, reminding me of the aromas you'd encounter in a burnt out fuse box." One person was more positive, finding "tight complexity with cherry, currants and some minerally fruit notes." Someone found it to be too tannic, with another taster sounding a similar note, saying it's "Way, way, way too extracted." Another participant said it reminded them of "burnt black coffee." I found some of the leathery notes which might be ascribed to Brettanomyces, along with some meaty, spicy notes. As it sat in the glass, I found the wine more reminiscent of some Syrah wines more than classic Cabernets. It's big, meaty and deep...a Cte-Rtie of a Cabernet. It has 5-10 years worth of tannin, at least. Half a star (on my three star scale, zero being ordinary or standard quality). "Sharp, tart and bitter!" were the findings of one taster. Another person found this to be reminiscent of "sour melons." Some agreed, saying "This made my mouth pucker." Another participant found "Nice tobacco notes, with rose petal aromas, good acidity and firm, spicy fruit. It's perhaps a bit hot, with a hot cinnamon 'burn', but it has a silky texture." Someone else found "sweet licorice and a lot of herbs like sage and bay leaf and some smoky notes." Another participant found this to be "a little bit sour, with nice cherry flavors." The last person to offer a description found "Bright fruit, good length and a good finish." I was really charmed by this wine, finding the 1998 Stag's Leap Cabernets to be real over-achievers. I described the nose as displaying sweet vanillin and cedary notes...vanilla bean and plenty of French oak and toast, along with a bit of cassis-like fruit. It's got a beautifully sweet "personality," having vanilla cream flavors and some blueberries with a lightly toasty flavor. Five to ten years of cellaring are not out of the question. Two stars +. 6th Place: FROG'S LEAP 1998 Napa "RUTHERFORD"
"Grippy, currants and boysenberry fruit along with some vanilla." were the findings of one taster. Another found this to develop in a positive fashion over the course of the tasting. One lady found "cranberry, humidor fragrances and tobacco, though it's a bit light and tart in the mouth...the grapes were not ripe enough." Though another person described this as "Softer and more approachable, with good balance." Someone else said it was "tight" striking them as though "the grapes were not quite ready at harvest." I found a nice fragrance of woodsy oak notes...there's definitely a contribution here from the barrels. The wine is woodsy and a bit earthy on the palate. Five to eight years of cellaring potential. One star. 5th Place: CHTEAU ST. JEAN 1998 Sonoma "CINQ CPAGES"
"This shows an elegance and subtle character, with black cherry and plums and has a firm, tannic finish." said one taster. Another found this "started to develop a green pepper note along with its vanillin oak." Someone said it was "fruit forward but then became vegetal on the palate." Another found some "vegetal notes." Another fellow described it as "Tart and having some rhubarb-like notes, though not so sharp." I described it as having lightly herbal aromas with a bit of cedar and a hint of a citrusy fragrance. It shows more dark fruit flavors, with a bit of tannin and a modest amount of oak on the palate. Five to ten years of aging potential. One star. 4th Place: MERRYVALE 1998 Napa "PROFILE"
"Rich and creamy, with mocha and currant notes and some toasted oak nuances." Another person said this had a "long finish." One detractor described this as "Awful! Tannic, bitter, sharp and having acetone notes. It stinks to high heaven!" More positively, someone found "Sweet oak and kumquat peel fragrances, with a bit of black coffee and black licorice. But it's disjointed. The acidity and fruit don't really mesh." I found the nose of this wine to be very pretty, showing a lot of cassis and berry fruit notes. There's a light herbal tone, but lots of sweet cedary oak with a dusty note. The wine seems supple on the palate, but does have a moderate amount of tannin. Very fine and stylish. Five to ten years of cellar potential. One-and-a-half stars+. "Full bodied with black fruits but it degraded as it sat in the glass." Others found more troubling features. "Something is wrong," said one taster. "The nose isn't good." 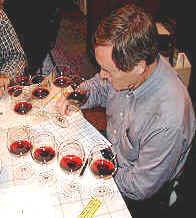 Another person found the nose to be "strange...hydrocarbon aromas with a Port-like quality." One fellow found "chocolatey tannins and ripened black cherries with a dusty plum note." Someone else found "leathery notes and herbal fruit...it's complex, but has a sour and woody note on the palate." Another participant felt they "charred the barrels too much. And it has leather and cedar notes with high acidity." I found the smoky, burnt oak notes to be troubling. There's also a fragrance which reminded me of Band-aids. It's lightly tannic, but seems shy in the fruit department and long in the toasted, burnt wood area. Half a star, if I'm generous. "Smooth, rich elegant vanilla beans, berries and milk chocolate" were found by one panelist. Someone else said it's "forward and has a nice flavor on the mid-palate." A third person found it "round and having a supple texture, with firm acidity and nice, sweet oak. Orange peel and chocolate notes, too." A fourth individual said it's "Well balanced and approachable." Someone else felt this displayed "the best nose." On a less positive note, one taster found it "sour and having lots of oak...there's a ton of wood here." I didn't detect THAT much oak, finding more blueberry notes on the nose with a hint of cassis and a lightly herbal note. It's got a candied violet sort of flavor with light oak. I didn't find that much tannin, viewing it as a two to five year wine. One star. 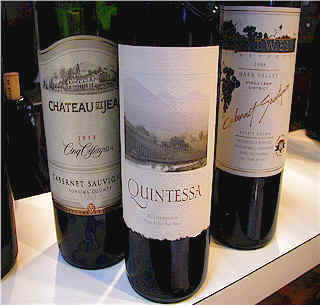 1st Place: QUINTESSA 1998 Napa "Rutherford"
"It's round, soft and approachable." said one panelist. Another found it "Awesome! It's head and shoulders above the rest of the wine." A third person found it to be "rich and having good depth, some plums and spice with subtle hints of chocolate, but it's really tannic." Someone else found it to be deficient in fruit, while another said it has a lot and described it as "opulent and having a lot of black cherry notes." Another found it's "wound a bit tightly, but it will open nicely with time." Someone else found "not especially intense aromas, but it's more energetic on the palate." My sense was of a dusty, earthy note at first, followed by a slight plastic or rubber fragrance. It's rather nice on the palate, having some mouth-drying tannins and dark, black fruit flavors. There's also a note of licorice on the palate. Five to ten years of cellaring potential. One star +.